If you’re a small business owner who has ever asked those questions, then you’re in the RIGHT place! At any given moment millions of people are logging on to their Facebook and Twitter accounts. But there’s a problem. And it’s a doozy. These potential customers of yours can’t find you on Facebook and Twitter. And that should make you angry. Because if they can’t find you, how can they do business with you? We’re entrepreneurs just like you. We understand that you’ve got about a million different things to worry about from one day to the next, and trying to stay on top of it all isn’t easy. We get it. Yeah, you’d love the customer engagement, leads and sales a strong social presence generates, but you’re swamped. How are you going to find the time or learn the skills necessary to succeed at social media? $99 a month. That’s all you pay for daily postings to Facebook and Twitter that engage, energize and expand your customer base. And don’t worry – we won’t hit you with hidden fees, price increases or contracts. The price really is $99 a month. Time is your most valuable asset and we’ll save you loads of it by offering a complete done-for-you social media service. A dedicated Social Media Manager Content Specialist will post relevant content to your Facebook and Twitter accounts, once per day, 365 days per year. We’ll take Facebook marketing and social media off your “to do” list so you can devote precious time to growing your business. 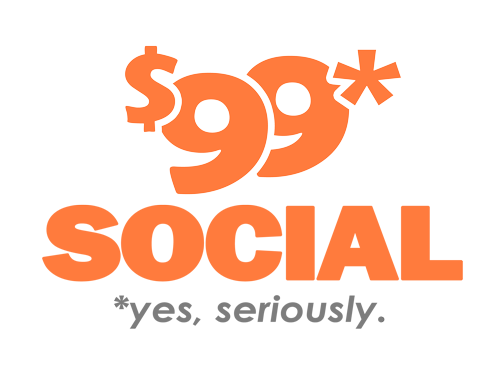 We started $99 Social because we love small businesses, and there was nothing on the market that offered an effective and affordable social media solution to people like you. It isn’t easy out there for small businesses; and you can trust that we’re as committed to your success as you are. You know you should “do” social media, but you’re not at all clear on what to do and you’ve got no time to figure it out. You feel frustrated and overwhelmed. And hiring a big marketing agency as a social media manager for your campaign? No way can you afford to pay their highway robbery, ahem, monthly fees. Maybe you’ve felt right on the verge of throwing your hands up in the air and just forgetting social media and Facebook marketing altogether. If so, $99 Social was created for you. It all began with an inspired idea: to offer small business owners a simple, honest, affordable alternative to marketing agencies that were offering social media services at frighteningly high prices. After tons of brainstorming, number-crunching, figuring, and planning, we were finally able to come up with a social media system streamlined enough to keep it simple AND affordable for small businesses. We launched $99 Social as a new kind of social media company – one dedicated to helping small businesses like yours thrive. Imagine: You’re just a few clicks away from getting a customized social media campaign that will attract more customers to your business and will transform those customers into brand evangelists. And you’ll get it all for less than you probably spent on your cellphone bill last month. All you need to do is click the “Get Started” button below to begin!